The flame shall not consume you, for God is with you. I’d like to take you to a scene that probably played out in a house somewhere near us over the holidays. John and Marie are first time parents of a two-year-old toddler, Jeremy. Jeremy never stops exploring and moving. Over the holidays his parents decide to light a fire in their fireplace for the first time since Jeremy was born. They meant to buy a fire screen but never got around to it, but anyway they are just going to light a fire log and they will be sitting right there on the old blue couch in their small cozy living room. It will be safe. They won’t take their eyes off Jeremy. Watch out! Keep away from the fire! Jeremy stares intently as the match is lit and the fire log comes to life. He stares – unusually still – at the flames. He reaches his hand out to the fire and his mother cautions – Hot. Don’t touch! He pulls his hand back but his eyes don’t leave the flames. Watch out! – She says – Keep away from the fire. After a moment he sits down on the carpet with his toys and loses interest in the dancing flame. John and Marie sit close together on the blue couch. Their love for each other and their son fills the room like a warm, cozy hug. They exchange a glance that speaks about love and gratitude … and a little exhaustion. In that split second Jeremy stands up and puts his whole chubby hand into the flame. His mother sees him and grabs him back, shouting “No. Hot! Don’t touch! Little Jeremy starts to cry. The father runs to get some cold water for his little burned hand. His mother holds wailing Jeremy in a tight hug, her heart racing. There is shouting and crying. But soon the crisis passes and on examination, Jeremy’s hand is barely red – he must have snatched it back from the fire very quickly. The sobbing stops and his parents hold Jeremy close on the blue couch and surround him in a huge hug, holding him tight to their hearts. They know that today he has learned about fire, but they also know that his life will be filled with other fires, other pain, and they hug him even more closely as if to protect him against the troubles that life will bring. They wish that their love would always keep him safe, but in their hearts they know they will not be able to protect him from the firestorms of life. John the Baptist brings us a different image of fire. We find ourselves on the banks of the river Jordan with John. People have walked for miles to hear John the Baptist preach about repentance. He is urgently calling on them to repent, to turn their lives around because the Messiah is coming. He brings us a frightening image of fire: the Messiah will “gather the wheat into his granary; but the chaff he will burn with unquenchable fire.” You see, in those times the grain stalks were threshed – beaten – on a threshing floor outdoors, to break the wheat kernels off the stalks. Then they would take a winnowing fork – like a pitchfork – and toss the stalks up into the air. The wind would blow off the “chaff” – the lightweight leaves and stalks, while the heavy kernels of grain would fall to the floor. The chaff, the dried stems and leaves, was no good for anything and it would be burned. The problem is … fire is all around us. We are sure to be burned by life. Our broken world is filled with wickedness, cruelty and grief. Our own lives are filled with challenges and trouble. We are human and we sin – we forget to pray, get swept up in our own lives and don’t help others, act wrongly, hurt people. We feel overwhelmed with the injustices and pain of the world and don’t act… and tragedy also comes unbidden to our doorstep – sickness, death, illness, loss. Often life can feel like we are not just putting our hand into the fire, but that we are passing right through a firestorm. We struggle to fulfill our baptismal promises. We don’t live up to our own expectations, or we are afraid that we don’t live up to God’s high standards. We fear that we are not good enough, not Godly enough. Perhaps in our heart we are afraid that we will be the chaff that gets burned. Well pleased. “well pleased” may have an air of faint praise about it, like “quite good,” but the phrase also means ”in you I have taken delight.” Taken delight! God the father delights in Jesus the son! The father loves Jesus in the way a parent loves a child. Can you imagine the father taking Jesus into his arms just as the parents took Jeremy into theirs? Arms filled with love and hope … but also a sense of foreboding, knowing the path Jesus must follow leads to death on the cross. Just as Jeremy’s parents know that their son will have to face the firestorms of life. And just as Jeremy’s parents delight in their beloved son, just as God the father delights in his beloved son Jesus, God delights in us, God delights in you! God is holding us even now in an unbreakable hug. God is with us when we walk through the firestorms of life. And unlike Jeremy’s parents, who are only human after all, God will never leave us. There is always room on the blue couch by the fire for us to be surrounded by a hug of God’s love. And if we stray into the fire, or as we walk through the firestorms of life, God is always with us. When we make wrong decisions, or don’t act as we should, and or tragedy comes unbidden to our doorstep, God is with us. When we struggle to do the right thing, to keep the promises we made at baptism, God is with us. God loves us even if we feel that we have failed. Even if we find we can’t even love our self, God still delights in us. We are always, always precious, beloved children of God! In our first reading, Isaiah spoke to the people of Israel, but his words offer reassurance for us today. I have been thinking a lot lately about the story Linh* shared with me some years ago. I want to share it with you. Linh was a carefree 18-year-old student who lived with her loving father. One day she woke to chaos in the streets of Saigon. Quickly she and her father packed two small bags – their documents, money. They joined the panicked crowd swarming to the port. It seemed that everyone in the city was trying to get on a ship, any ship, to flee Vietnam. Linh, wearing a sleeveless pink sundress and sandals, lost sight of her father in the chaos. She found herself swept up in the crowd and, frightened and alone, she handed over her money to the captain of a rusty old ship. As the ship, overloaded with frightened people, pulled away from the pier, she scanned the crowd in vain for her father. The captain sank the old ship just off the coast of Malaysia and dumped the refugees into the waves. Linh, unable to swim, struggled to shore, half drowned, losing her bag, her documents and even her sandals. Many did not make it that far. The Malaysian authorities, overrun with refugees, took these “boat people” to a desolate internment island. It was a place stripped of trees and plants, without clean water or enough food. Linh and many of the refugees become very ill. More died. Linh was so sick and filthy that she was spared being raped. Linh told me: I had lost my father, I was so sick, I wanted to die. I lost track of time. Sometimes I thought I was already dead, that I was in hell. Eventually a small group of brave Christian aid workers arrived on the island, living in the same terrible conditions as the refugees. Overwhelmed by the need, they offered what little medical care they could from their tent. Linh, still very ill and in deep despair, was suspicious. She asked through an interpreter why these people came to live in this hell to help strangers. Their incomprehensible answer was simple “Because of Jesus.” Still barely alive, she felt a glimmer of curiosity, a spark of hope. Inexplicably, against all odds, someone cared. One day, as Linh sat limp on the rocky ground in the hot sun, she heard her name called on the loudspeaker. She stirred. The people around urged her forward to the aid workers tent. She was still numb, ill and didn’t speak English. But before she knew it, she was on a ship, then a plane. She did not understand where she was going, but she didn’t care. She followed and walked as if she was dead. Someone gave her a pair of flip flops decorated with pink flowers. Eventually the plane landed and Linh stepped out in Vancouver in her dirty pink sundress and pink flowered flip flops. Without a word of English, without documents, alone, weak, in a daze of grief. But when she left the terminal she saw a street lined with cherry trees, covered with blossoms. Soon Linh was reunited with a relative in Vancouver, and three months later her father was found at a refugee camp. Together they started a new life in Canada, and Linh found her way to a church to learn more about this person called Jesus. She learned English, went to college and worked as a graphic designer. Her children are in university now. Every spring, when the branches on the cherry trees are covered in blossoms, Linh gives thanks for her life and her home in Canada. The aftermath of the ice storm in our neighbourhood. 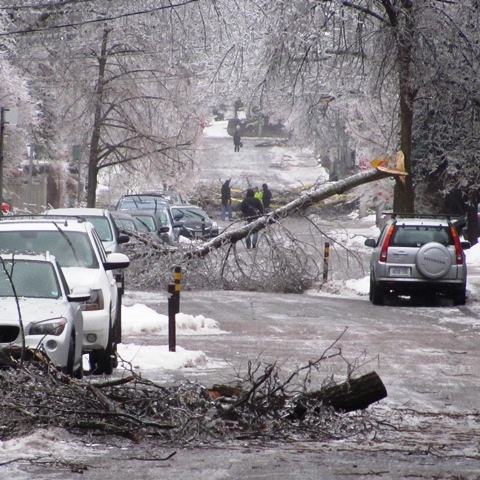 On December 23, 2013 Toronto was in the aftermath of the Ice Storm. Huge swaths of the city were without power. But I had been visiting “Edith” in palliative care for a number of weeks and I was determined to visit her for Christmas. I walk into Edith’s room – shared with two other people. Only the emergency lights are on, and outside the window the city is dark as far as I can see. The two other women in the room are asleep or unconscious – surrounded by loved ones keeping silent vigil. A breathing machine roars and hisses in the corner pressing a dying grandmother to take one laboured breath after another. Edith is sitting up and alert. She greets me: “You came! No one else is coming because of some problem on the roads.” I explain about the ice storm, the city-wide power outages, the trees toppled by the weight of the ice on every street. Cut off from the news, she didn’t know about the storm. I water her plant, give her a Christmas card and settle in for a visit. I ask what she remembers of the candlelight Christmas Eve services at her church. We reminisce about the smell of the oil lamps and the music. Especially the music. “Since you can’t get to church, shall I read from Luke?” I ask. She nods. I pull out last year’s Christmas Eve bulletin – which I had somehow found in my darkened home – and read Luke’s account of the nativity. In a loud voice, over the roar and hiss of the breathing machine in the corner, I read about angels and shepherds and a newborn baby. Edith is rapt, soaking up every word. I can feel the other visitors in the room leaning forward, listening. “Do not be afraid; I bring you good news of great joy for all people.” The words have new meaning in this room where the patients are weeks or days or even hours away from leaving this life. The room is focused on me and I feel a little self-conscious. “Would you like me to sing a carol?” I ask Edith. “Oh yes!” she replies, her eyes gleaming with delight. Summoning my best and loudest voice, channeling my meager music training, I sing a verse of Silent Night over the sound of the roaring, hissing breathing machine. Edith mouths the words with me. Her eyes shine. A nurse changing a bed behind a curtain joins softly in the singing. I launch into Hark the Herald Angels Sing. The nurse comes out from behind the curtain and sings with me. As I start O Come All Ye Faithful two more nurses join in, singing from the doorway, and the visitors sitting with their dying grandmother sing too. At that moment it seems that all the company of heaven is in that palliative care room. It turns out that was Christmas for Edith. No-one else managed to get through the ice clogged roads to visit her. And there was no candlelit Christmas Eve service at her church either – the power was out. Edith fell asleep in God’s arms a month later and passed into what awaits us on the other side of death. I think she is singing with choirs of angels this Christmas. Tonight I will remember that precious night in the darkened hospital room as I sing Silent Night.